Has there ever been a mama who longs for the night when her child will wake up more than a dozen times? Has there ever been a mama who relishes spending more than half of her night attached to her thirsty babe? Being a nursing mama is a night and day job. And it is hard work! We all look forward to the time where the whole house gets to sleep through the night. Many moms are told that night weaning, or not allowing babe to nurse until morning, is the solution to long nights. So should you night wean? Will night weaning help baby sleep? Will it help mama sleep? Is it Time for Night Weaning? Our pediatrician told me to night wean at six months. Many friends also suggested that this would help our baby sleep better. But is there evidence supporting this idea? According to Psychology Today, night nursing may actually help infants and toddlers sleep better than if they were night weaned. There are many reasons behind this, but an important one is that breast milk contains tryptophan. Yep, the stuff that makes us sleepy after a big turkey dinner also helps our little ones drift off to sleep after nursing! Amazingly, the only time that our bodies make tryptophan is while lactating. Nursing also seems to have an instant calming effect on babies. This means that when we wait to night wean, we have the magical tool of mama’s milk to quickly settle babe back to sleep when they wake at night. For most babies, and even some toddlers, other methods like rocking, singing, and cuddling seem to take longer. A longer time to settle means less sleep for everyone! It’s also important to consider that waking for milk or cuddles is incredibly normal for babies and toddlers. In fact, babies are wired to wake up. Regular waking is even a built-in protection against SIDS. It’s sure not easy for parents, but it is normal for baby! Recognizing that this behavior is normal should make us feel less of a need to “fix” the frequent wakings by night weaning. Waking up to nurse can be exhausting, but there are so many benefits to that midnight milk. For mamas, night nursing is vital to establishing and maintaining a good milk supply. Frequent emptying of the breasts, even overnight, also protects against mastitis and clogged ducts. Additionally, the hormone prolactin, which helps us feel that wonderful bond with baby, is at its highest overnight. Responsively caring for your little one and helping ease them back to sleep! 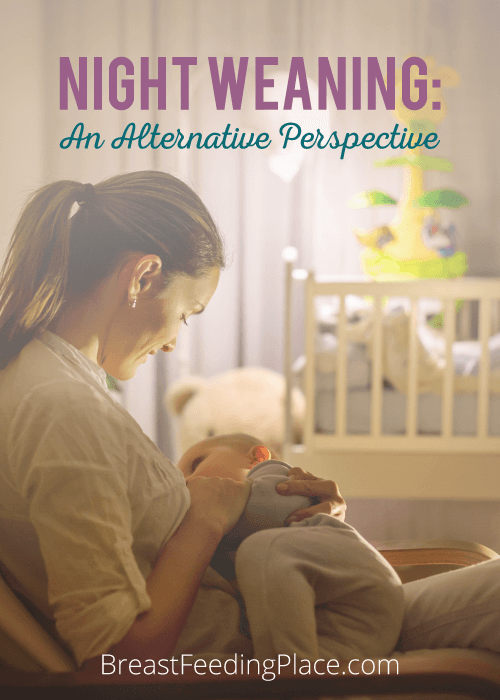 While it may be tempting to consider night weaning, mamas should make sure that they’re prepared to give up the many benefits overnight nursing has for babies and mamas alike. This may mean turning a deaf ear to unwanted or antiquated advice. Trust your instincts mama, and trust that baby when he wakes you up asking for milk. This won’t last forever. Finally, if you’re looking for ways to catch more sleep, many moms find that co-sleeping, also referred to as “breastsleeping” is a great solution. Another option is to reach out for help. Do you have a relative or neighbor who can spend an hour once a week at your house so that you can have a nap? Are there things that dad can do throughout the night to make nursing more restful for you? You may find an option other than night weaning to work for your family!